Jonathan Stroud did it again with this amazingly new series. Although this is the third book, it is the first time I am writing about a review for this series. Lockwood and Co. is set in London, where the world accepts the existence of ghosts and the harm they inflict upon civilians. People have taken up defenses against this otherworldly presence and have turned ghost hunting into a business. These businesses mainly employ children as they have the clearer way to see, feel, and hear ghosts. One such company is Lockwood and Co. The story is funny and exciting, which seems to be a trademark of Stroud. 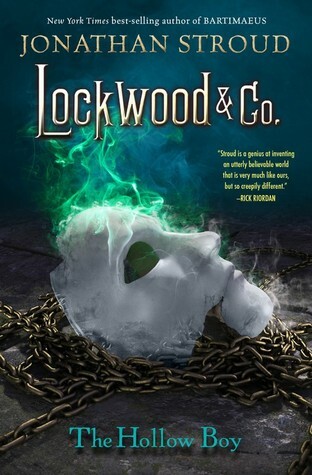 Though the story is told in Lucy's POV, I grew to love the witty, smart, and mysterious Lockwood. I keep imagining him as some kind of a Sherlock type of character: a quick-witted, silver-tongued devil that can be a bit dense at times but always pulls through at the last minute. Actually, the way the characters’ traits compliment each other is great. However, with the addition of new characters that will join this trio, I would love to see how they would fill Lockwood and Co.'s shortcomings. Lucy's pettiness over the new recruit Holly only enhances her character, making her more believable and solid in my mind. I will love to see this character grow even more. It is great how at the end of each book there's a kind of a glossary so you can keep track of the terms, classifications of ghost, uses of anti-ghost objects, and such. This was really well researched because I remember reading up on various items mentioned and their uses to ward off evil spirits. So far, I haven't encountered problems with this series, though I have to admit the first two were a bit better than Hollow boy. I hope Stroud can come up with a much exciting plot for the next one.